Christmas is coming - only 130 collecting days to go! Well, much fewer if you are thinking of the Christmas issue from Royal Mail, which will be issued on 5 November 2013. This year the theme reverts to Religious with the stamps depicting again the art of the Madonna and Child as seen across the centuries. One of these is a brand new design especially commissioned for Royal Mail. The designers are once again Robert Maude and Sarah Davies, who designed the Auto Legends Workhorses miniature sheet. The Christmas stamps from now on will be larger than the Definitive size used in recent years with each stamp both standard and large letter being 4mm wider and taller than recent years at 24 x 28 mm for the standard size and 34 x 28 mm for the Large stamps. As usual there will be separate sheets of stamps for each value, the miniature sheet shown above, at least one generic sheet, 1st and 2nd class retail booklets, stamp cards, first day covers, and a presentation pack. Given that the stamps will be taller than the Machin definitives it will be interesting to see how they are supplied in booklets and the generic sheet. Although larger stamps could fit onto the sheet, with smaller decorated margins, the standard size booklets would be too small for 12 stamps, as have been issued in previous years. 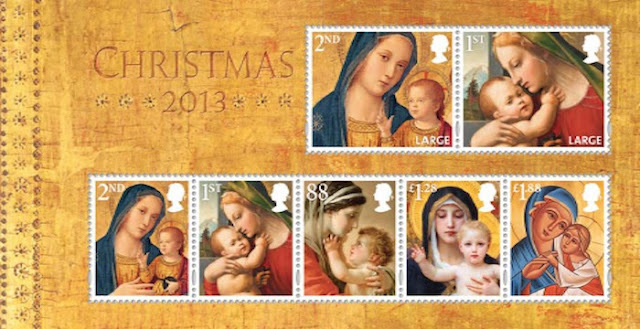 As well as the stamps shown above, Royal Mail organised a competition for school-children to design festive images for a second set of 1st and 2nd Class Christmas stamps. These will be issued on the same date, and there will be an official first day cover and further presentation pack. Some designs are shown on the page linked above, the short-listed designs are shown here; the winners of the competition will be announced in the autumn. The Generic sheet will contain 8 each 2nd and 1st class stamps, 2 x 88p, and one each of the £1.28 and £1.88 which means that there will only be one set of stamps in the sheet. The £1.88 will not be available for personalisation in the Smilers service. 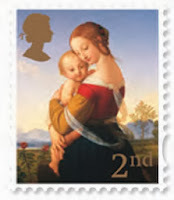 Royal Mail have advised that the new 2nd and 1st class stamps will be reissued in subsequent years, replacing the ones issued in 2007. This year, there will be the two Christmas stamps designed by children, probably with secular themes I suspect. Might this be a pattern for future years? 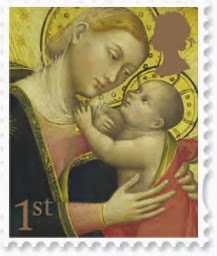 - the Madonna stamps when Royal Mail have a secular theme, and vice versa? No reason why they should be secular; in fact I suspect the judges will choose one secular and one religious. But I doubt very much whether this means the same again next year. It's 30 years since we had children's designs on Christmas stamps and unless the designs are very good I think a similar gap would be a good idea! A very nice set of Christmas stamps, and I actually prefer the size format of the actual stamps, I've always hated those tiny stamps with passion. 3 first day covers all together, actually its not bad one of those covers will only cost £1.10. I'm actually looking forward to these.